This document presents the Area Method (AM) or Dual Coverture Value (DCV) method of dividing a military retirement upon divorce. Because the name DCV confused people, the name was changed to a more descriptive "Area Method". Original research reveals the Area Method accomplishes the same division as older methods, yet is simpler. AM also applies to a much wider scope of life situations which were previously impossible. AM works for Active Duty or Reserve, and any combination of marriage before or after military duty - even multiple marriages. For a Reservist, it also properly handles Reserve early retirement (retirement payments before age 60, earned and accrued only after January 28, 2008). No other method can do all of this with equity. AM can save significant litigation costs because the simplicity and clarity invite equitable mediation. This page includes a lot of mathematics. Another web page gives practical information about using AM in the legal system. Single Coverture and Dual Coverture are discussed on other web pages. A letter to DFAS proposes the Area Method to replace the Hypothetical Method because it is easier and more capable and backward compatible. USFSPA laws allows military retirement benefits to be divided as a present day asset rather than future income. Doing so often manifests in a divorce order that says the spouse is awarded nominally 50% of the "military retirement earned during the marriage." You cannot believe how unecessarily complicated it has gotten to actually describe what portion was earned during the marriage! The stakes are large. Military retirements are a significant benefit, earned by both women and men. As of March 2011, there were more than twice as many military women divorcing (local copy) than men. Among enlisted, the military women divorce rate is about 3x that of men. The overall military divorce rate in 2011 is 64% higher (local copy) than it was in 2001. Military divorce is a significant social issue affecting both sexes. Dollar value of a military retirement in 2012 dollars range from $945,000 for an E-7 to $2,800,000 for an O-8 (20 yr E-7, or 30 yr O-8, living until age 75). AM discussed in this document addresses how to describe what part of a military retirement is divisible as a marital asset and calculate the coverture fraction needed by the military Defense Finance and Accounting Service (DFAS). Athough AM is applicable to Active Duty and Reserve military retirements, if you are intested in Reserve military specific issues, please also see another web page about dividing military reserve retirement pay. Additional web pages deal with law and statutes, promotion enhancements, dual coverture, practicum and examples, and a proposal to DFAS. My graduate degree taught me to handle data and numbers with fidelity, and to provide defensible answers that represent truth. My aerospace flight test engineering work involves using data and metrics to create and test models of the real world on which people's lives depend. Mathematical tools are used to monitor, verify, and predict the real world. I turned these skills toward division of military retirements. I developed the Area Method (AM) model of military retirements that allows easy math to divide this marital asset in the case of divorce. Division methods have accumulated since the 1982 USFSPA laws and a 1998 Department of Defense Report to Congress regarding the functionality of USFSPA laws. Spouses, attorneys, and judges have struggled to understand the military retirement system and have grappled with equitable division through lengthy, repeated, and narrowly scoped litigation. Over the last few years, I have had the opportunity to consult for attorneys and clients going through divorce, and AM has proved to be particularly useful in arbitration and mediation because it is so lucid that it removes the desire to litigate. I am looking for professional review from the legal community, and partners to publish AM in family law journals and other newsletters reaching out to educate family law attorneys. The goal is to determine the Marital or Coverture Fraction, multiply by the Share Fraction (often 50%), then document the percentage number in a court order. Each month, DFAS will multiply that percentage by the retirement pay and determine the ex-spousal payment. A hierarchical diagram of all methods is given below. It helps to understand that the purpose of any method is to simply generate a marital fraction. After all the effort is said and done, creating the percentage number is the entire point of all the methods except the fixed dollar method. The red equal sign in the green flowchart above is meant to indicate that the Dual Coverture and Hypothetical methods yield the same percentage if one stipulates that COLA is the same as military pay raises each year. Much more documentation is available from the references below. Some authors, such as attorney Mark Sullivan in his "Silent Partner" series, misrepresent this issue. For example, on Page 7 of his "Military Pension Division: The Servicemember's Strategy" edition, he states, "There are four separate ways to make the division that DFAS will accept." This is not true. The DFAS examples of Percentage Clause, Formula, and Hypothetical Method are simply different examples of how to calculate a percentage. Anything that gives DFAS a way to calculate a percentage is acceptable. A tabular comparison of method features is given below. Time-value of money given after payments start? Both receive military pay raises. Both receive military pay raises. Both receive military pay raises. Time-value of money after divorce, but before before payments start? Able to set aside promotion value pre-existing the marraige? Protects ex-spouse from pre-marital set aside at higher rank? Handles promotions and service credit for multiple spouses? * Although civilian methods are inappropriate for dividing a military retirement, this column is included in the table because some attorneys/courts continue to use only this method because this is what they're familiar with. This behavior damages military members with lack of equity, and is inequitable in many cases as annoted above. If a myopic view continues, courts will continue to be reversed and attorneys risk malpractice settlements. Web page titled "Division of Military Retirement Pay - Promotion Enhancement" gives a point by point rebuttal to the civilian method; continuing to use it when it's documented to be inferior and inequitable is inexplicable. Only the Area Method allows proper handling of military duty and promotions that existed as a pre-marriage asset. Like a car or dining room table pre-existing the marriage, pre-existing assets are not divisible. Pre-existing retirement asset value can be quantitatively separated and does not comingle with the rest of the retirement. Only AM can do this. Additionally, when more than one spouse is involved, only the AM can properly divide a military asset among multiple spouses and the military member. The value of both Reserve and Active Duty retirements can be visualized as an area. The idea of an area (multipling two numbers toegher) works because a product of two variables is how a military monthly retirement check is calculated, plus an extra 2.5% factor and any conversion factor between points, months, years and days. For example, an Active Duty person retiring after 20 years would get 50% of their monthly base pay. For a Reservist, service credit has been expressed in points to divide retirements. The Area Method could do fractions that way, but instead points are converted to months to maintain similarity with Active Duty retirements, and to match the Federally mandated retirement formula, which converts all points to years. For a Reservist, the Federal goverment defines years = points/360, so months = points/30. In the diagram below the horizontal axes shows the number of months of military duty for retirement. This example happens to be from a Reservist, so the numbers were obtained from points. The military member had 1129 duty points when they married (1129/30=37.633 mo), 6300 points (210 mo) points when divorced, and 7990 points (266.333 mo) as of retirement. The vertical axis is monthly base pay looked up on a pay chart for a single year (2009 in this example). You can use whatever year you want, but all three values on the vertical axes are looked up on the SAME paychart. Do not look up the earlier values using earlier pay charts. Use the same year paychart to find basepay of the different ranks and different times. Because the numerically precise and quantifiable nature of a military retirement allows such calculations, there is no comingling. The area of any part of the diagram represents asset value. The white part of the diagram shows the portion of the total retirement that is a marriage asset. The white part is to be divided. The shaded parts are not to be divided. Before Marriage. Dotted area. The dotted portion earned before the marriage is not a marriage asset. It pre-existed the marriage and because of this, it is not a marital asset according to state law in almost every state of the union. The area value is quantifiably separate, and is not co-mingled like a bank account brought into marriage. When listing assets during divorce discovery, each party lists bank accounts and assets. During this time, it is appropriate to note "militarly retirement asset presently worth 2.5% * $4148.10 * (1129/360) yr = $325.22/mo" was earned before the marriage, and is quantifiably separable, and is not co-mingled with anything during later years, and is not a marital asset. This is identical to listing a car or motorycle or dining room table you owned before the marriage, and having those items exempt from division. During Marriage. White area. This area is typically the asset portion divided. After Marriage. Cross-hatched area. Case law sometimes allow civilian passively-earned enhancements after a marriage to be divided when the receiving party has to wait to get the money. Duty points and promotions earned after marriage are not passively earned like interest on a bank account or time-value of money or dividends of a 401(k) type retirement. Dividing passively earned enhancements may be appropriate to return time value of money -- appropriate for an investment or bank account that can not yet be transfered. However, military duty and promotions are actively earned enhancements based on effort, schooling, study, and testing. They are not passively earned like bank interest; they are earned by additional work and effort. Done after marriage, this effort is not shared by an ex-spouse. This area of enhanced retirement value earned after the marriage is not a marital asset and should not be divided. If you want to try numbers specific to your situation, download the Area Method calculator spreadsheet (pre-NDAA 2017 or post-NDAA 2017) from the references section below. A practicum with step-by-step examples is also available. A letter to DFAS includes a spreadsheet showing the Area Method or Dual Coverture Value calculations. Determine if something is a marital asset. USFSPA allows, but does not direct, a court to consider military retirement as a marital asset. However, all portions of a military retirement are not marital assets unless all of the military career was during the marriage. Determine asset values as of some date. This is typically the date of separation, the date of filing divorce, or the date of final divorce order. Specificity and precision of military retirement formulas makes this easy. Decide how to divide the asset. Many courts go with 50:50. Sometimes there are legitimate reasons to deviate from this, but it's usually an uphill battle to argue against 50:50. The Area Method coverture fraction is calculated by diving the value of the white portion area of the above diagram by the total area value. It's that simple! No other pre-existing method is anywhere close to this level of simplicity. William Troyan, of Troyan, Inc writes that the New Jersey appellate court decision to use Dual Coverture makes the preparation of division orders substantially more complex. I disagree: AM methods are simple! It's just that nobody prior has envisioned and communicated the simple "before-during-after" area diagram displayed above. The area of the white area does not change later in life based on the military members actions. No matter how much additional duty is done, it never dilutes in value. If promotions occur, other parts of the diagram become larger, but the marital asset portion does not become larger or smaller. However, all portions of the chart do become larger if there are military pay chart increases. Also, if a military person does not ever retire, then nobody gets any retirement, and in the words of a Michigan Appellate court, "awarding 50% of nothing is not in error." Another option would be to enslave the military person by forcing them to continue enlistement until retirement, or try to obligate non-military retirement, which would be out of scope of UFSPA and earned outside the window of marriage. Conflicting with this, some attorneys like Willick have suggested forcing military memers to retire ASAP to get the payments started. V is the value base pay at marriage, divorce, or retirement (according to the subscript), all from the same year pay chart. Multiply the coverture fraction by the disposable retirement monthly payment, and you will have the marital asset. The non-military spouse is typically awarded 50% of the marital asset. 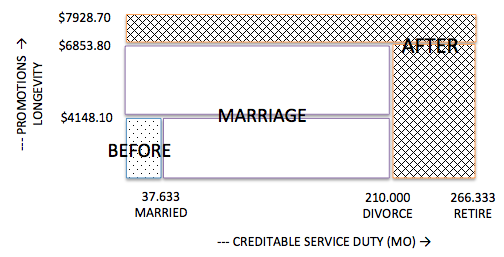 If there was no duty before marriage, on the diagram above there would be no "Before" area and the marriage values DM and VM are zero, and the AM formula simplifies to the Dual Coverture method showing a ratio of duty days and a ratio of pay at rank. Dual Coverture and AM give the same mathematical result as the DFAS Hypothetical Method if one stipulates COLA raises are the same as military pay raises. You can see they are the same my simply moving the paratheses in the formula, while keeping the formula the same. Notice that the AM method may always be used because the math formula automatically simplifies to do the more simple cases. For this reason, AM should always be used in court orders because nobody can predict if promotions or additional marriages will happen in the future, necessitating a revisit to the court if the other limited methods were used. The legal language to implement the AM method for military duty both before and after a single marriage is given here (replace all the bolded values with YOUR values). This is the textual equivalent of dividing the white area by the total area, creating the coverture fraction. The idea is to simply describe the area that is a marital asset, and divide it by the total area. “The former spouse is awarded a percentage of the member’s disposable military retired pay each month, to be computed by multiplying 50% times a Coverture Fraction, the numerator of which is is 1283191. The Coverture Fraction denominator is member’s total number of duty months for retirement times basepay upon retirement. All basepay values will be looked up on the 2009 year pay chart. If a Reserve retirement is obtained, months = points / 30." Using the numbers from the continuing example above, the marital asset would be 60.77% of the retirement net disposable amount. Spousal portion would be 50% of that or, 30.38%. If you wish, see another example on the AM Practicum web page. The AM method of diagraming phases of life and the divisibility of retirement earned during those phases of life is so lucid and simple that the area diagrams can be reduced to icons. The horizontal axes represents time moving from left to right across the bottom of the icons. The vertical axes represents the value of promotions and longevity. Remember, the specific dollar amount corresponding to any area goes up each year as the military base pay goes up. In each diagram below, the white portion would be the divisible marital asset, while the dotted portion would not be divisible. The coverture fraction is calculated by dividing the white area by the total area. The legal division order language would simply describe how to calculate the white area divided by the total area. The numerator would always be a number, and the denominator would always be the same - waiting for DFAS to plug in numbers if the military member is not yet retired. This diagram represents becoming 1) married, 2) military, 3) retired, 4) divorced. In other words, the entire military career was shared with the same spouse. No coverture fraction is required. Non-military spouse receives nominally half of the disposable monthly retirement payment. This diagram represents becoming 1) married, 2) military, duty with or without promotions, 3) divorced, duty without promotions, 4) retired. Because there are no promotions after the marriage, this can be handled like civilian retirements with a single coverture fraction. This diagram represents becoming 1) military, 2) married, duty and promotions, 3) retired, 4) divorced. This diagram represents becoming 1) married, 2) military, duty with or without promotions, 3) divorced, duty with promotions, 4) retired. In this situation, the Dual Coverture Value method simplies to the Dual Coverture method. This will give the same result as the DFAS Hypothetical method if you stipulate that military pay raises are the same as COLA. This diagram represents becoming 1) military, duty with or without promotions, 2) married, duty without promotions, 3) divorced, no more duty or promotions, 4) retired. This diagram represents becoming 1) military, duty with or without promotions, 2) married, duty and promotions, 3) divorced, duty and promotions, 4) retired. This diagram represents becoming 1) married #1, 2) military, duty with or without promotions, 3) divorced, duty and promotions, married #2, 4) married, duty without promotions, 5)divorced, 6) retired. * The symbols and subscripts in the third column are defined earlier on this web page. For this chart, the formula is simplified by cancelling common factors in the numerator and denominator. In the Fall 2012 newsletter of the ABA Family Law Military Committee, Amy Privette, a previous paralegal for Mark Sullivan, wrote an article titled "Quick Tips for Handling Military Retirement Benefits". She echoed her mentor's errors by identifying four DFAS methods of dividing military pay: fixed dollar, percentage, formula, and hypothetical award. These correspond to Sections IV(A), IV(C), and IV(D) of the DFAS 2012 document titled "Guidance on Dividing Military Retired Pay." Privette stated that award formulas had to be stated one of these four ways to be acceptable to DFAS. This is incorrect. In fact, there are only two (2) acceptable types for DFAS, while DFAS gave four (4) examples. Confusion like this pervades the area of military retirements asset division. Quoting paragraph IV(A) from the DFAS document, "The USFSPA states that for a retired pay as property award to be enforceable, it must be expressed either as a fixed dollar amount or as a percentage of disposable retired pay." Notice this quote identifies 2 options (fixed or percentage), not 4. 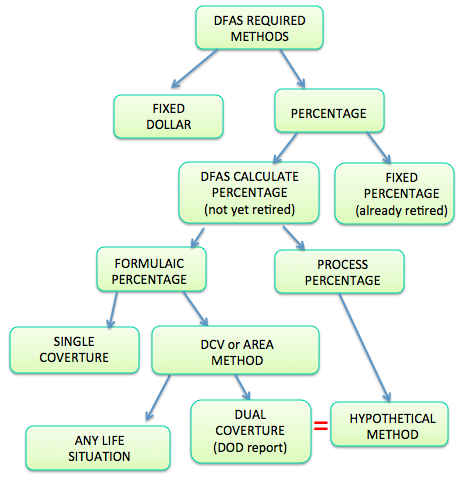 It is critical to realize that the DFAS "formula" or "hypothetical methods" calculate a percentage and therefore fit into the second type. See the green hierarchy diagram above. More revealing is the fact that ANY method that creates a fraction percentage is acceptable to DFAS, so long as the fraction is directly stated, or is possible for DFAS to calculate. In DFAS' words, "If a court order provides a formula award and also provides all the variables necessary to compute the formula, we will complete the calculation as is [sic] using those variables provided in the order." If the fraction or percentage from two different methods is the same, then any two methods are the same. This appears in the hierarchy diagram above with the red equal sign. How you got to the fraction just doesn't matter to DFAS. All Dual Coverture methods create fractions and can be calculated by DFAS. It is instructional to take each of the DFAS examples of creating fractions and correlate them to the Area Method of creating the same fraction. Simpler DCV Formula giving the same fraction. percentage calculation not required (just state it). Selecting the proper method from the table above will correctly divide the monthly retirement paycheck for Active Duty military and Reserve military. For Reserve military, there is also a question of which paychecks are to be divided. The value of the retirement asset includes attention to dividing which checks in addition to dividing each check. Traditionally, Reserve military retirement checks start when the military member turns 60 years of age because that's when a Reserve retirement begins to pay out. However, 10 USC 12731(f)(2)(A) created a new and quantifiably separate retirement for Reservists that does not comingle in any way with the traditional retirement, and is created and is accrued only based on military duty after January 28, 2008. If the ex-spouse did not participate in earning the new benefit after that date, then retirement payments before age 60 are by definition not marriage assets and therefore not divided. For more detailed reading, see the Reservist retirement division web page or the bottom of the Area Method web page. Besides dividing each monthly payment, some or all of the monthly retirement payments before military member age 60 may not be marital assets. See details in the document "Attorney Instructions - Division of Reserve and Active Duty Military Retirements" from the references below, and the web page "Attorney Guide Dividing Military Reserve Pay". If a marriage exists only after January 28th, 2008, then the retirement asset is to be divided the same way as described above. If a marriage ends before January 28th, the ex-spouse in no way contributes to the retirement points accumulated after January 28th, which month-for-month dictate how many months prior to age 60 retirement pay is started. Getting these extra months of pay is based only on duty after January 28th. Under this second condition, the payments before age 60 would have a coverture fraction of zero -- in otherwords, the non-military spouse would receive no portion of the payments before age 60 because the spouse in no way contributed to the duty points causing the payments. In this situation, the asset division order must explicitly tell DFAS to not divide payments before age 60, and divide payments like normal after age 60. If the marriage spans January 28th, then the payments age 60 and following should be divided with a coverture fraction as described in all the paragraphs above. For payments before age 60, a new area value diagram must be created using only points after January 28th. The horizontal axes of the second diagram would include points ONLY earned after January 28th. The vertical axes would start with point value as of January 28th and show only promotions after that date. This second area value diagram would yield a second coverture fraction to apply for all payments before age 60. DFAS must be provided with both coverture fractions and directed to use one before age 60 and the other for age 60 and following. The resultant damages of doing military division with a single (civilian) coverture when it should be a Dual Coverture or Area Method are significant. If someone divorced as a Major and retired as a Colonel, the 2013 pay chart shows a 34.4% increase in retirement (proportional to base pay) due only to the rank change attained after marriage. Other situations would be higher or lower. Because the 34% mistake would comes from the military member to the non-military member, that creates a double, or 68% average, error in equity. This is much larger than other differences judged to be significant by courts, including the 15% rule of thumb on income changes to change support payments, or the 5% threshold where medical insurance would be ordered for a supported child. Over a 20 year retirement, this would accumulate a $878,481 mistake in marital asset value. Multiply this error by the number of military in the nation and the number of divorces, and you'll see that this is a $Billion dollar issue that needs the lucid, equitable clarity of the Dual Coverture Value method. Original research has revealed the Area Method accomplishes the same division as previous standard methods, yet is much simpler. AM also applies to a much wider scope of life situations which were previously impossible. If you want to try numbers specific to your situation, download the Area method calculator spreadsheet from the references section below. A practicum and example are also available. Mork white paper: Attorney Instructions - Division of Reserve and Active Duty Military Retirements (increa copy). DFAS "Guidance on Dividing Military Retired Pay", March 2014, 25 pdf pages with bad formatting, 121 KB pdf. (DFAS.mil, increa copy). Older copy April 2012, 20 pgs, 119 KB pdf. (DFAS.mil, increa copy). Older copy "Attorney Instructions - Dividing Military Retired Pay", April 2001, 19 pgs, 74kb pdf. (DFAS.mil, increa copy). DCV Does Simple Division Orders--reply to William Troyan. (out of date - see below for update) PRE-NDAA2017 Excel spreadsheet for doing Dual Coverture Value (Area Method) Calculations, September 2012. Includes court order legal language. (out of date - see below for update) NPOST-NDAA2017 Excel spreadsheet for doing Dual Coverture Value (Area Method) Calculator, March 2017. Includes court order legal language. UPDATE: Excel spreadsheet for doing both PRE- and POST-NDAA2017 calculations. "Air Force divorce rate highest in military", December 2011. (militarytimes.com, increa copy). "Be Specific in Divorce Agreements to Avoid Future Legal Trouble", March 2011, (airforcetimes.com, increa copy). This document was edited using Kompozer. © 2017 Brian Mork, Ph.D.